stylos: Reflection on Philippians 2:25: Was Epaphroditus an Apostle? Reflection on Philippians 2:25: Was Epaphroditus an Apostle? Here’s another reflection spurred by reading D. B. Hart’s translation of the NT (Yale, 2017). He renders Philippians 2:25: “But I deemed it necessary to send you Epaphroditus, my brother and fellow worker and fellow soldier, as well as your Apostle and attendant to my needs”. I was struck by the description here of Epaphroditus as an “Apostle” (and capitalized at that). The underlying Greek noun is, in fact, apostolos, though the Geneva Bible and KJV renders it as “messenger,” no doubt wanting to distinguish the use of the term here from its usage in reference to the twelve apostles and Paul. Interestingly enough, Tyndale also rendered the noun here as “apostle” (but with a lower case “a”). First, it can refer to the twelve apostles (cf. cf. Matt 10:2; Mark 3:14; Luke 6:13; Acts 1:20) and to Paul (cf. 1 Cor 15:9; Gal 1:1) as extraordinary officers and the founders of the Christian movement on Christ the chief cornerstone. Second, it can refer to special disciples who were not the twelve apostles or Paul. These served as distinguished church emissaries (messengers) and assistants to the apostles. 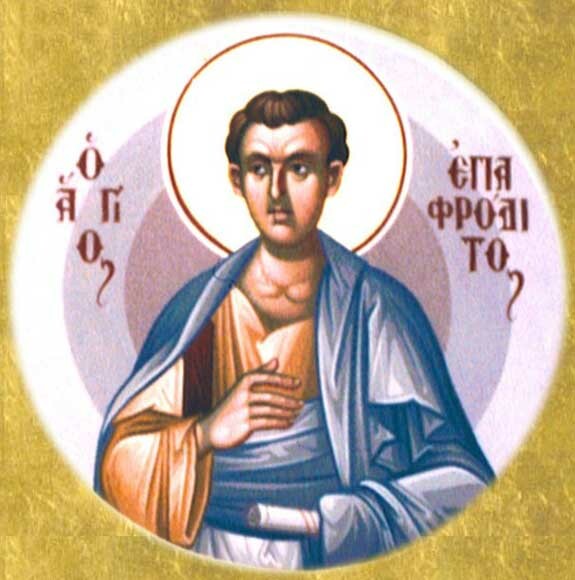 The term apostolos is used in Acts 14:4, 14 in reference to both Paul and Barnabas. 2 Corinthians 8:23 makes reference to Titus as being among the apostoloi ekklēsiōn, as Tyndale, Geneva, and KJV all render it, “the messengers of the churches [Tyndale: congregations],” again making a distinction here from the twelve apostles and Paul. It is intriguing that John knows and makes use of the term “the twelve” (cf. John 6:67, 70-71; 20:24), but does not use the term apostoloi in reference to the twelve, as in the other Gospels (again, cf. Matt 10:2; Mark 3:14; Luke 6:13). Fourth, it is used as a title in reference to Jesus in Hebrews 3:1: “consider the Apostle and High Priest of our profession, Christ Jesus” (KJV). So, what did Paul mean when he called Epaphroditus an apostolos? The usage here fits best category two above, so that Epaphroditus was, like Barnabas, Titus, and other “messengers of the churches” an esteemed emissary and apostolic helper but not one of the twelve or a “special” apostle like Paul. It is also interesting how the early particular Baptists used the term “messenger,” taken from the Tyndale-KJV tradition to refer to the representatives of “churches holding communion together” (2LBCF-1689 26:15).